I’m sorry this photo doesn’t do the salad justice. There were 3 starving women at my house for girls’ night and they were about to attack when I decided to stop and take pictures of our food. I’m telling you all that to encourage any other like-minded blue cheese nay-sayers to give this salad a chance. There is something about the combination of the flavors in the vinaigrette, nuts, and greens that melds with the blue cheese and makes it way less offensive. I would dare say not even offensive at all. Actually, this salad is quite delicious and is a regular on our table. So if you are thinking about subbing out the blue cheese with something else, try it at least once as written. You won’t be disappointed. This recipe comes from the out-of-print Bay Tables: Savor the Abundance by the Junior League of Mobile. If you can get your hands on a copy of this book, you will love it. I haven’t been disappointed yet and I will try to share some of my other favorites as I make them. 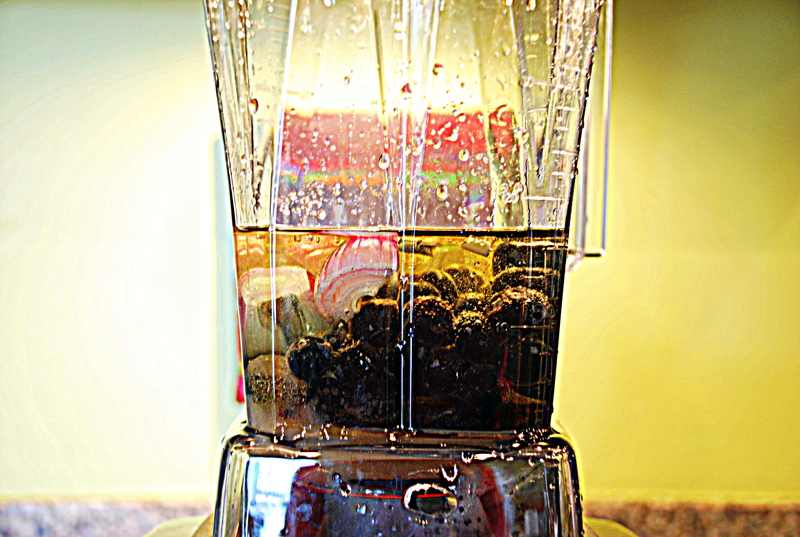 Combine the shallot, 1/2 pint of blueberries, salt, sugar, vinegar, and oil in a blender and blend well. 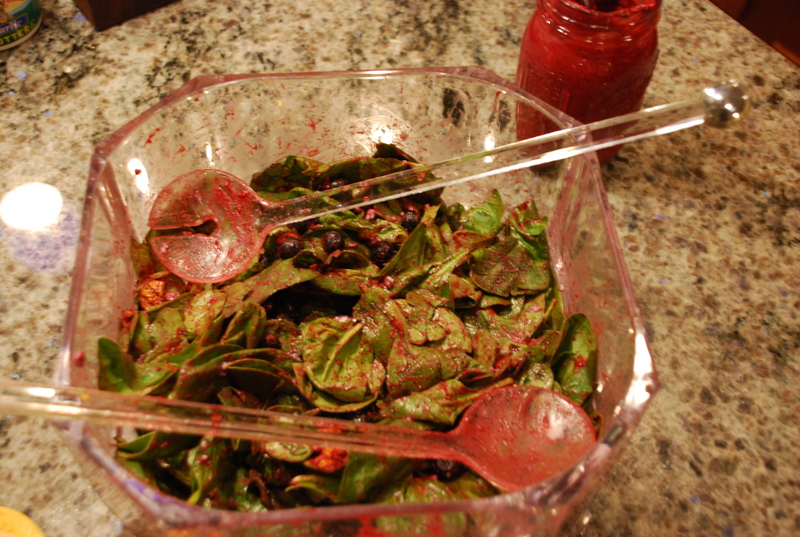 Combine the spinach, remaining berries, blue cheese, and pecans in a large salad bowl and toss to mix well. Add the desired amount of blueberry vinaigrette (you will probably have more than enough) just before serving and toss until well coated. I couldn’t resist — I was having fun with some new features on my photo editing software. And this is a glimpse of the new blender I got recently. Last week I made two shirts! Are you impressed? 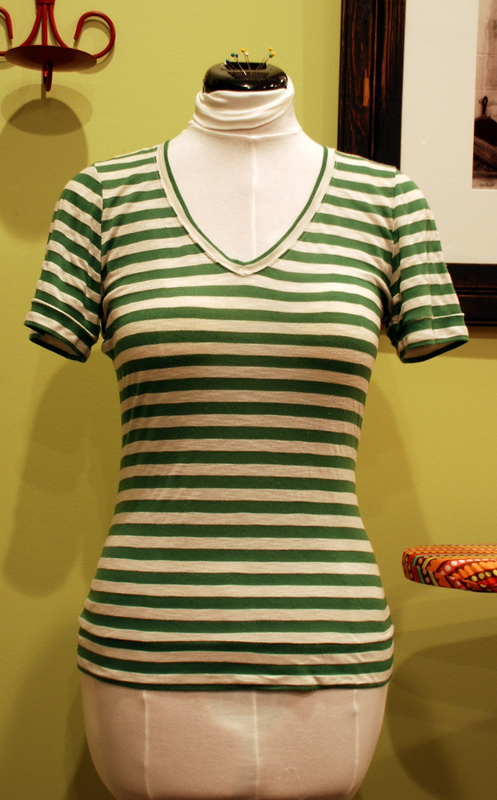 The best part is that with a regular sewing machine and about 4 hours (maybe less), you can have one of these tops, too. 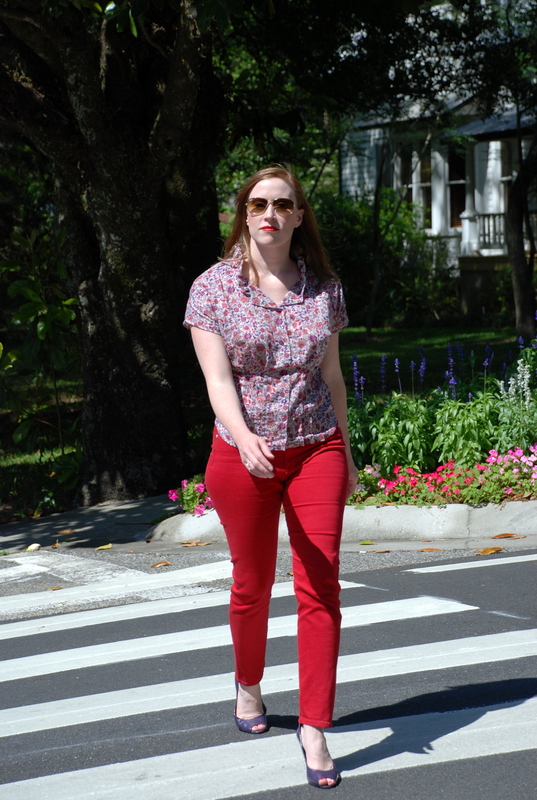 I love this pattern because it is a fitted t-shirt that doesn’t involve hemming knits — the cute bands on the waist and sleeves solve that problem with style. Fabric — Green and white unknown knit remnant I picked up for $5 at a local shop. It is slightly sheer so I wear a white cami underneath. I probably have enough fabric left to make another top. It drove me crazy but I managed to get the stripes reasonably matched up. 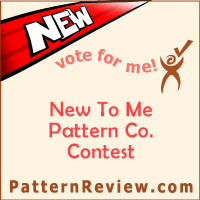 Likes — Quick to sew, great length, body hugging style. 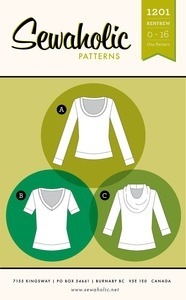 I also like that the pattern gives several different neckline and sleeve variations. I had to do some tweaking to get the fit right since the pattern calls for a stable knit and mine definitely was not. Also, the pattern is drafted for a B-cup, so I cut a size larger in the bust and tapered back down at the waist. Dislikes — I hate to even label this as a dislike because I think it is really more a side effect of my fabric (unstable knit), but my waistband is too loose and doesn't hug my hips like I would like for it to. Don't get me wrong, this version is totally wearable, but I find myself smoothing the waistband against my body regularly so it doesn't flare out. 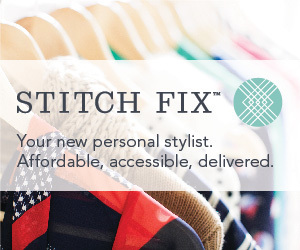 Tips — If you use a less stable knit, consider cutting your arm and waistbands a size or two or three smaller and easing them on. I did this on version 2.0 and it solved the loose waistband problem. I also cut the neckband in version 1.0 15% smaller than the neck opening and this made the neckline lay nice and flat. You may also consider using some clear elastic in the neckline to keep it from stretching out and to make it nice and snappy. I will try to get pics of my second version up soon. 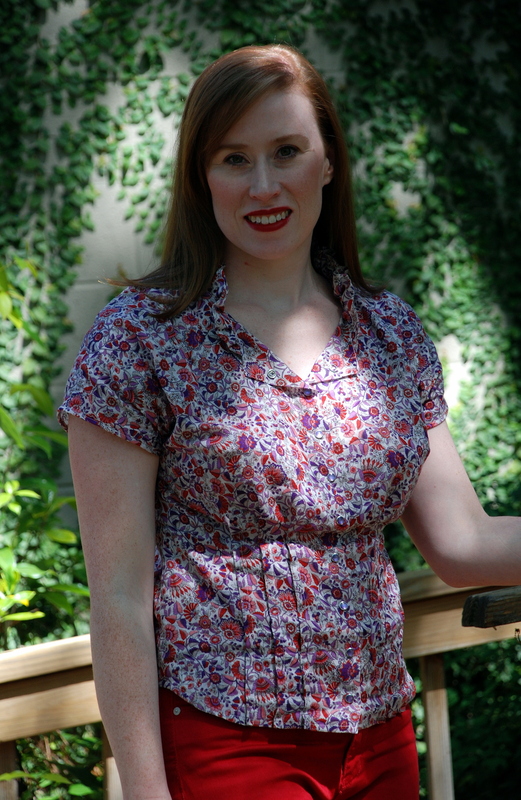 I am also working on the new Sewaholic Cambie dress and I have two delicious recipes in the queue so stay tuned! First of all, I would like to say a big “thank you” to my excellent photographer, my wonderful husband of almost ten years, Matthew. He was so sweet and so patient to take multiple shots of me, especially since I hate having my picture taken. We had fun scoping out cool spots in our neat little downtown. This top was made from Vogue 1045, which is one of Sandra’s designs. I used a Marc Jacobs cotton lawn or voile (maybe someone with more fabric sense can tell me the difference) that I picked up at a wonderful little fabric shop called Promenade on St. Charles Avenue in New Orleans. 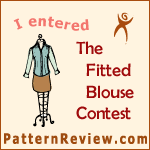 Although the pattern did not specify this type of fabric, I did not want to end up with the type of blouse that was depicted on the pattern cover. Sandra helped me modify the front blouse pieces to create a self-lining eventhough this was not called for in the pattern. The extra step made for a very nicely finished inside since there are no visible unfinished seams. I chose to finish the front closure with cute little lavender pearl snaps instead of the large buttons that were called for. I interfaced the placket with a single layer of silk organza but in hindsite, should have used something a little more sturdy as I am a bit afraid to pull the snaps apart. The tucks at the front and back add nice waist definition and allowed for easy alteration to perfect the fit. Sandra advised me to cut out a size D based on my full bust measurement but I ended up taking the top in quite a bit to achieve my desired fit. If I ever make this pattern again, I will start with a size C all around. Somehow the back of the blouse ended up a little shorter than the front — this is a pet peeve of mine since I don’t like my waist band or muffin top showing. Next time I will lengthen the entire blouse hem an inch or two. Since Sandra helped me create the self-lining in the front, I didn’t have to hem the front of the blouse — only the back required hemming — and Sandra suggested using a fusible tape instead of the method described in the pattern (a bias strip). All in all, the class with Sandra was a wonderful experience and I had such a good time hanging out with a room full of women who loved sewing as much as (if not more) than me! I hope you will make time to enjoy these today. This mix is so simple and so much better than the stuff you buy at the grocery store. You can keep the mix in a large jug in the fridge and use it as needed (just be sure to shake it well). Our Reach Out and Read coordinator, Polly, approves!! Combine the pineapple juice and cream of coconut in a large screw top jug. Add half the can of condensed milk. Close the lid on the jug and shake well to mix. Continue adding condensed milk to taste until desired sweetness is achieved. Fill 16 ounce cup to brim with crushed ice. Pour in rums. Fill with piña colada mix to top of ice. 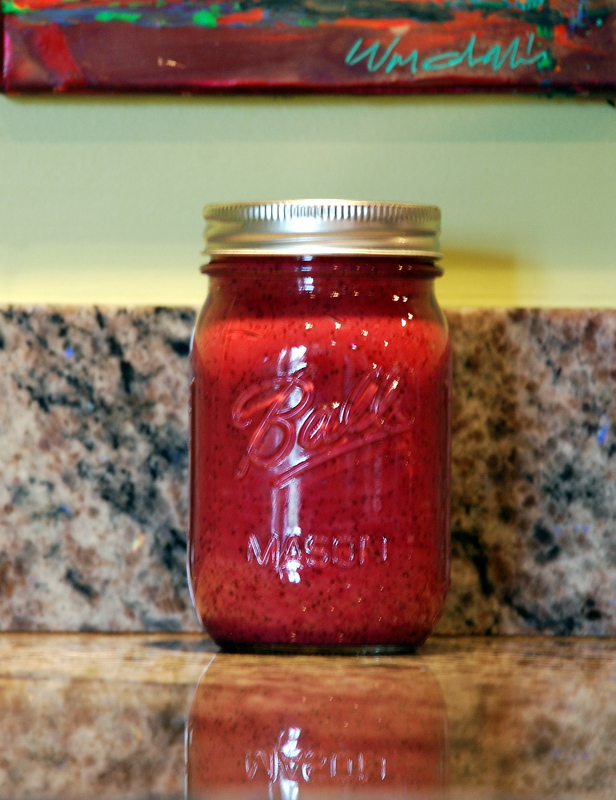 Pour into blender and blend on low speed. Gradually increase speed to high and blend for at least 30-60 seconds. The longer you blend it, the smoother and creamier your piña colada will be. Garnish with fresh pineapple, cherry, and umbrella, if desired, and enjoy! 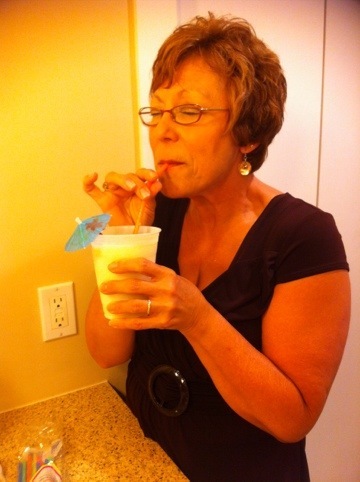 *To make a virgin piña colada, omit the rum and replace it with 1 1/2 ounces of water. Water is necessary to ensure the mixture blends properly.